For five decades, distinguished sportswriter Doug Krikorian chronicled LA's most transcendent sports moments. Revisit revered columns enshrining iconic achievements like when rookie Magic Johnson scored forty-two points and collected fifteen rebounds, leading the Lakers to the NBA title against the Philadelphia 76ers. Celebrate with the Angels all over again after their 2002 World Series victory. Reflect on momentous stories featuring Eric Dickerson, Wayne Gretzky, Muhammad Ali and many other illustrious personalities. 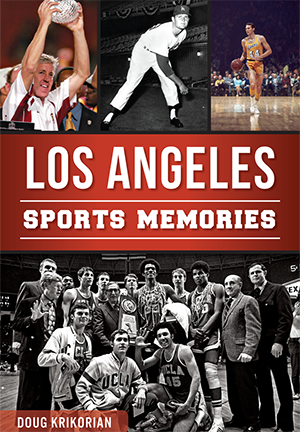 From Wilt Chamberlain and Kareem Abdul-Jabbar's fervent feud to Dodger Kirk Gibson's legendary game-winning 1988 World Series opener home run, relive the triumphs and tribulations of one of America's marquee sports towns. Doug Krikorian chronicled the Los Angeles sporting scene for forty-four years—twenty-two at the Los Angeles Herald Examiner and twenty-two at the Long Beach Press Telegram. He covered all the major football, basketball, baseball, boxing and hockey events during that time, and was known for his pungent views on a variety of subjects. He resides in the Long Beach enclave of Naples.